You can always do Hong Kong shoe shopping with great sale before any big festivals, such as Christmas and Chinese New Year. There may be summer sales. But you definitely can get a steal about a month before the Chinese New Year. Because a month after, there is almost no sale in the shoes stores. Hong Kong people are very superstitious that buying a pair of shoes in the first month of Chinese New Year. It will bring bad luck to them for the rest of that year. There are big varieties and places for you to pick. Be prepared that some places are much pricier. But you get what you pay. Can't resist to take this shot in Hysan Place. This shoe is GORGEOUS. 1) Wing On & Sincere - They are Hong Kong originated department stores with long history. Their shoe department always have good quality shoes. 2) Nine West - It's my favorite place to do Hong Kong Shoe Shopping. Their design and quality are always in front of the trend. I see their new items in Hong Kong a year ahead of the States. 3) I.T. - This is the place for teenagers. They used to have awesome shoes with superb quality. Now, it's mix and match. It depends on your luck. Everything in this store is very pricy. But if you find some great quality shoes, the price is actually not bad at all. 4) Lee's Garden Arcade, Causeway Bay - There is a store in there with superb quality. I mean SUPERB. It is very expensive. But to me, it's worth every penny. 5) Hysan Place, Causeway Bay - This is a new mall right across Jardine's Crescent. There is a whole floor just devoting on shoes. 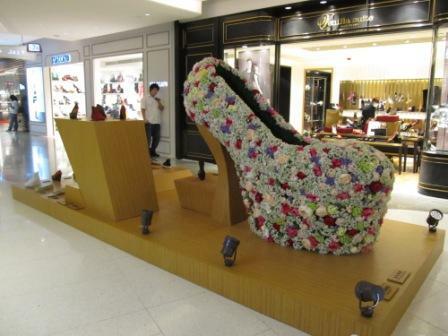 Many famous brands have their shoes in their own stores, especially on the 3rd floor of the Pacific Place in Admiralty. Check them out while you do any Hong Kong Luxury Shopping. Don't be surprised that certain brands do sell their shoes 2-3 times more expensive than the outlets in the States. If you are looking for low prices and made-in-China shoes, any lady markets will have those available. Also, size measurement of shoes in Hong Kong is European, not U.K. or U.S.